The new mobile phone from INQ - the Mini 3G - has been given official pricing, and will be offered for £59.99 on pay as you go. The new handset, which is part of a dual release with the INQ Chat 3G, will also be available for free on £15 per month contract from 3. The new phone will be dropped into stores and online in the UK from October this year, with the INQ Chat 3G following closely behind. The new INQ Mini 3G - along with the Chat 3G - offers a dedicated Twitter client, allowing users to let their Twitter feeds run in the background and simple Tweeting from the home screen. The press release also hinted at other handsets too: "the INQ Mini 3G is the first mobile to follow the new look and feel for future INQ handsets. 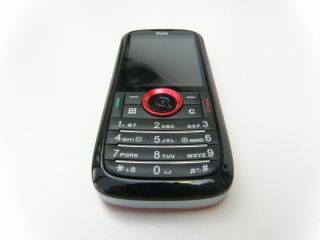 It can also be customised with a range of seven coloured backs". The INQ series follows the popular INQ1 phone, which was the first to offer Facebook contact integration, something that's since been seen in the likes of the Palm Pre and the HTC Hero. Check out our hands-on and picture gallery of the INQ Mini 3G and Chat 3G earlier this year, and get ready for an in-depth review in the near future.